Adjustable Focus: Zoom in with circle floodlight for large area illumination; Zoom out with intense spotlight for long range observation up to 600 feet. 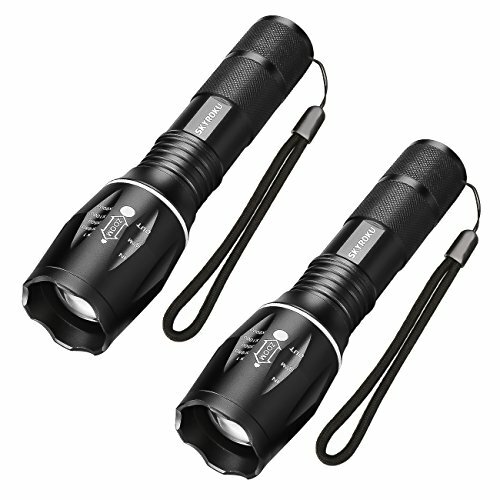 Portale & Premium: The SKYROKU flashlight is made of rugged aluminum, anti-skip construction; 5.3 inch long is portable to carry. Micro-Innovation: Luminous ring at the head of the flashlight, you can find it easy when power cut or in emergency. Warranty Policy: The wanrranty time is 1 year. Any quality problems occur during the using time,please contact us, we will resovle it within 24 hours.